Nfinity Princess Backpack. The Princess Backpack, because sometimes you just feel royal. This pack will get you through the rigors of school and traveling on the road all while feeling special. 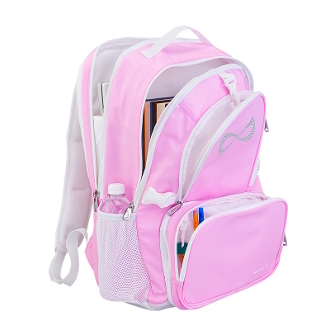 This one-of-a-kind pack features padded shoulder straps, 4 compartments perfect for holding your Nfinity® Shoes, a padded laptop sleeve, stylish detachable purse adhered to the front and an adorable rhinestone sparkle logo. Great for cheerleaders, gymnasts, skaters and dancers! Padded laptop compartment fits 15”laptop. Large main compartment to hold the Nfinity® Shoe case. White Nfinity® Logo interior liner. Detachable front pouch converts into a purse with a space that can be embroidered with a team logo *in-house customization not available.